"I do not understand hatred as a sport. How does one win?" 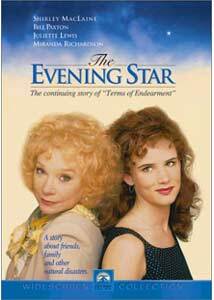 While I was watching The Evening Star the word "unnecessary" kept running through my head: Was there any real reason to make a sequel to Terms Of Endearment? There are some movies that exist for no reason, and The Evening Star ranks high on that list. Much like the first film, 1983's Terms of Endearment, Aurora Greenway's life is overcome by the death of loved ones. In the original film, this premise worked because of the great performance by Debra Winger, as well as the direction of James L. Brooks. In this sequel, made nearly fifteen years later, none of the redeeming qualities that made the original a multiple-Oscar® winner are present. Shirley MacLaine returns as Aurora Greenway and—aside from a short cameo by Jack Nicholson—is the only original cast member to return in this film. When Aurora's ongoing fight with Melanie (Lewis) gets out of hand, Melanie moves out. But it doesn't take long for Melanie to discover that her boyfriend, a would-be actor (Wolf) is being unfaithful, forcing her to move back in with Aurora. At the same time, Tommy (Newbern) has grown up and spends his days in prison where Aurora visits him faithfully. With all of this going on it isn't long until Aurora gets hit with a bout of depression, sending her to the arms of a therapist (Paxton) who has a mother-fixation. Eventually they sleep together, which makes for more problems in her life. For the most part, The Evening Star doesn't work. Based on the novel of the same name by Larry McMurtry, who also penned the original, the movie seems more like a recycling of plot points from Terms Of Endearment, with the death count turned up. The Evening Star doesn't believe so much in showing us tragedy; it would rather force-feed it to us. The film does have one lone bright spot, which comes nearly three-quarters of the way through, to give it a shot in the arm. Garrett Breedlove (Nicholson) returns for a short cameo that makes the movie look a little better: that is, until he goes off the screen. Director Robert Harling, who has specialized in writing "chick flicks" for years, makes his debut behind the camera with The Evening Star and his efforts are less than inspired. Harling's biggest mistake is that he just doesn't know when to end the film. There are several times when I expected to get up and turn off my system because I thought the picture was over—little did I know that it would go on and on and on. Shirley MacLaine obviously has a good time with her role as Aurora and it shows on screen. In fact, the acting is the one thing that makes The Evening Star tolerable. Juliette Lewis, who I personally do not like, is good as Melanie. Miranda Richardson and Bill Paxton have nice supporting roles, with Richardson nearly stealing the movie. Image Transfer Review: The new 1.85:1 anamorphic transfer for The Evening Star is well done for the most part. The only thing that makes this transfer not earn an "A" grade in my book is the large amount of edge enhancement. It never becomes a big problem, but it is noticeable and the soft, almost cloudy look doesn't help matters. Fleshtones look natural and sharpness and detail are done very well. Colors and black levels look fine, and there is no pixelation evident. Audio Transfer Review: The Dolby Digital 5.1 mix for The Evening Star is certainly more active than I ever thought it could be. While there are no explosions or gunfire, the score is mixed perfectly into the surround channels giving it a nice 360-degree soundfield. Dialogue is well done and always clear, and the left and right speakers have a nice well-defined separation. An English Dolby 2.0 track is also available. Extras Review: The one significant extra for The Evening Star is a commentary track by director Robert Harling. The track suffers from several moments of silence, as well as Harling's seemingly unanimated comments. He does serve up some nice thoughts on the film and the screenplay, but ultimately the track just doesn't hold one's attention. The misleading theatrical trailer for the film is also available. The Evening Star suffers from many problems, the least of which is that it has the unfortunate pleasure of having to measure up to a great film. If you have Terms Of Endearment, then you probably have no trouble planning to place this film alongside it. But for those who are curious, just give it a rental.